The final of 50 parade floats in the Chalmette Irish, Italian and Isleno parade, where they not only throw beads and trinkets, but also vegetables, fruit, and here, toilet paper. It has a sprint since getting back from AAG in New Orleans. It was my first time at that epic event, spread across several downtown hotels. I was surprised to actually run into people I knew from other organizations like IASNR and topics like rangelands, ecosystem services and climate adaptation that I didn’t necessarily connect with Geography, including MES alum Paul Sylvestre, now doing a PhD at Queens. Didn’t lay eyes on my Dalhousie colleagues, however, without effort. Geography is big enough in its traditional form, but it has expanded and become much more problem-based than the Australian Geographer’s Association meeting in 2005 after which I swore off Geography conferences (that one kept human, physical and spatial geographers in never-the-twain separate sessions irregardless of topic). Happily surprised, I attended four or five of the Climate Vulnerability and Adaptation special sessions organized by the Human Dimensions of Global Change Specialty Group, which had many highlights but particularly memorable were Hannah Gosnell’s talk on happiness and regenerative grazing (HM) in Australia, and Neil Adger’s speech after his lifetime achievement award, as well as his former postdoc Don Nelson’s moving tribute. I was pleased with the content if not the crowd size in the two sessions in which I participated, on Recycling Energy Landscapes and (via Mike Smit on our new SSHRC) in Computation for Public Engagement in Complex Problems: From Big Data, to Modeling, to Action. Phase 3 of a 3-phase demonstration of the value of wetland buffers in protecting cities from storm action in the Presbytere Museum. It was grand to be back in New Orleans after 16 years, even through a deluge event with flood warnings. I was lucky to get into my old apartment which was wide open, being gutted for renovation. My old boulangerie is still there (though the fougasse is not as I recall), and the streetcars still charm. The French Quarter Festival was on – all local music – and the best food we found was offered by ex-military cajun Adam Lee out of a small pub kitchen uptown in Prytania Hall. A muffuletta sandwich from the Central Grocery, eaten in the sun in front of Jackson Square listening to a brass band, came second. Nothing else came close. Very cool to see ‘planning for water’ and the importance of wetland buffers highlighted in the Presbytere’s museum installation on Katrina. Jean Pierre Fazende, a free man of colour and New Orleans grocer, inherited land within the battlefield in 1857. After the Civil War, he divided it and sold it to freed slaves from local plantations. Eventually the community grew to more than 200 people and became known as Fazendeville. The National Park Service bought the land in 1966 after long, contentious negotiations. Where did they move to? Mostly the New Orleans 9th Ward, that area so hard hit by Katrina. What a bad joke. The old main street is visible only as a linear depression today, but the plaque says the community still meets. Like the residents of Africville here in Halifax, or former residents of what is now the Gagetown weapons range in New Brunswick, they have reunions and otherwise somehow keep the community alive after being forcibly removed. 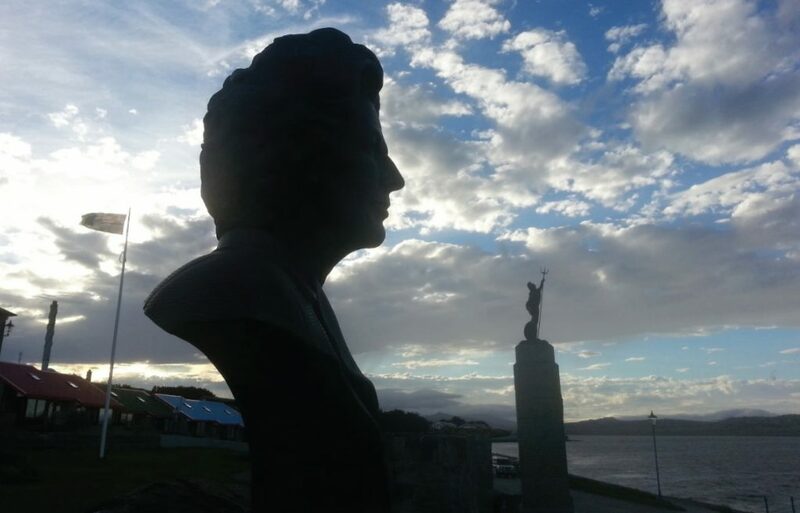 “The place where Margaret Thatcher is most warmly remembered”: Flanked by the Falklands flag and the 1982 Liberation Memorial, a bust of Margaret Thatcher watches over Stanley Harbour at sunset. Today is the 36th anniversary of the start of the Falklands War, which I think of as “my first war” because it was the first to penetrate my childhood consciousness, otherwise occupied with all things me. It feels therefore fitting that today my short article reflecting on my month in the Falklands, called The New Battle for the Falklands, appeared online at Canadian Notes and Queries. It also appeared in the Winter issue 101 of the print version (p. 15-18). Emotions lingered from my time in the Falklands that were making it difficult to write up the work for a scholarly audience, so I challenged myself to write about it in a venue and with language more accessible to the public. Now CNQ is a literary journal– hardly plebian–but it is also quite funny and well-designed thanks to graphics by Seth. It also has a strong cultural storytelling angle and an ‘abroad’ column available to those who want to write about travel so it was a good fit.